Published on September 6, 2016 in inspiration, News, Self catering holidays and top destinations. Closed Tags: paralympics, self-catering accommodation. In a little over 24 hours time the Rio Paralympics will be underway and we will be cheering team GB with a firm hope and belief that they can emulate the outstanding success achieved by Great Britain during the Olympic Games. Much like the Olympics, the Paralympics is a showcase of some of the most inspiring and impressive athletes anywhere in the world, their stories often having a great and profound impact on people. To celebrate the start of the games we have taken a look back at the success of team GB at the 2012 games and have compiled a short list looking at where these athletes were born and raised. The UK is such a diverse and vast landscape, full of so much natural beauty and human ingenuity and these athletes’ backgrounds do well to reflect the diversity of the team GB talent pool. Building on from here triple gold winning effort at the 2004 Athens games, Deborah Criddle returned to produce another whirlwind performance which saw her take home 1 gold medal and 2 silver’s at the London Games. Criddle was born in the charming Somerset town of Taunton. This charming town has undergone a regeneration project that has given a new lease of life to the area. The area itself is surrounded by many landmarks and attractions, such as Exmoor National Park and the West Somerset Railway, that help to make this a wonderful place to live in or visit. Born in ‘the UK’s Ocean City’, Jonathan Fox had great success during the 2012 games, improving on his silver medal winning effort in Beijing, and picked up a gold medal for his 100m backstroke effort. 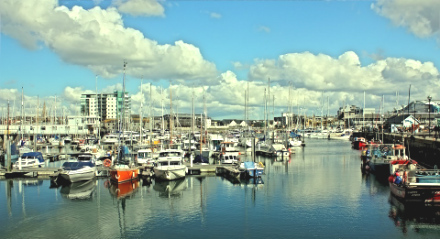 Fox was born in the city of Plymouth in Cornwall, which has long been famed as one of the best coastal destinations in the UK. The area is full of a rich history and excellent attractions. In 1620 it was from here that the Pilgrim Fathers set sail to the New World aboard the Mayflower and guests area able to learn about this fascinating tale in much detail here. What’s more, families can enjoy a host of attractions that include the wonderful Dartmoor National park and a range of beaches such as Whitsand Bay. Aged just 16, Jessica-Jane was able to hold her own and won a gold medal for her 200m freestyle swimming. Applegate was appearing at her first games and will be hoping to repeat and build on this success at the Rio games. Applegate was born in the Norfolk coastal town of Great Yarmouth. This seaside town has been a popular tourist destination for many years and is full of great family-friendly attractions such as Pleasurewood Hills Theme Park, Thrigby Hall Wildlife Gardens, The Pleasure Beach, and much more! Similarly to Applegate, Oliver Hynd managed to claim gold at the young age of 17. For his efforts he was voted Disabled Sportsperson of the Year by his home county at the Nottinghamshire Sports Awards. Hynd was born in the market town of Mansfield which is well known for its excellent range of family-friendly attractions.